Few names are as famous in the world of academic book selling as Blackwell’s. In 1879, Benjamin Blackwell opened his tiny bookshop in Broad Street in Oxford. Surrounded by illustrious colleges, Mr Blackwell’s business prospered, gradually taking over the warren of old buildings which still constitute the heart of the family business. Benjamin’s more famous son, Basil, won a scholarship to Merton College but returned in 1913 to take responsibility for the publishing division, and taking the helm in 1924, he led the business for over sixty years. The frontage to the Broad Street shop is quaint in an Olde England kind of way. Squeezed between the two entrances to the shop is The White Horse, a minuscule pub and favourite haunt of Lewis and Morse. Take the entrance on the right – the steps are steep and narrow, again, in a pleasingly historic manner – and enter. The stock is attractive: it’s a cut above your typical Waterstone’s, intelligent and selected for the discerning reader, with an excellent hardback fiction section as well. But it does little to suggest what lies beyond. Indeed, many tourists have entered the shop (I’ve met them several times) and wondered what all the fuss is about. The visitor needs to ignore the stairs up, walk towards the back and down stairs to discover the Norrington Room, a vast cavern devoted to book selling. Here, one will find the sections on Science, Medicine, Philosophy, Economics, Politics, Theology and Education – the latter two are particularly impressive, holding the best range of books in the subjects that I’ve found anywhere. Upstairs, there’s the usual History and (a nice Oxford twist) a magnificent Classics department, great for either the works of Catullus or even Winnie the Pooh in Latin! Conveniently next to the Literature section is the obligatory coffee shop (nice ambience, shame it’s a Cafe Nero and not something a bit more independent) where in term time students rich enough to shell out for coffee and cake are to be found between piles of unbought books and laptops – some seem to use the shop more as a library. Up on the third floor, meanwhile, is the rare books and secondhand department, which, in the days before Amazon marketplace, saved me as a student as small fortune. But like so many other bookshops, Blackwell’s ain’t what it used to be. Nor is Oxford for that matter: the city has changed in the last fifteen years, almost unrecognisably. Gone are many of the fine public houses. Gone are too many of the shops which marked out Oxford as a little different. Chief amongst the greatly lamented shops is the legendary Thornton’s bookshop – once a treasure trove of unexpected finds, stacked to the ceiling, complete with ladders to reach the upper shelves, and celebrated by the poet Elizabeth Jennings. Instead, Blackwell’s excepted, Broad Street is increasingly stuffed with useless tourist traps and faux coffee shops – one pretentiously called a buttery to give it that ‘authentic’ varsity feel. And Blackwell’s has changed. Today, Blackwell’s is a national chain of over forty shops (it now owns one time Cambridge competitor Heffer’s) but the impact of Amazon and e-readers is evident. Gone is Blackwell’s Music Shop and gone, too, is the children’s and young people’s shop. Inside the main Broad Street shop, meanwhile, it’s hard not to notice the gradually shrinking English Literature section. Literary criticism seems to be allocated less space each time I visit, though drama and poetry seem not have been hit yet; indeed, Blackwell’s in Oxford has one of the finest poetry sections I can think of to this day. And the staff seem younger, but perhaps that’s just me ageing. Nonetheless – and the clichés are true – no visit to Oxford is complete without stepping inside Blackwell’s. Opposite the Sheldonian Theatre, a stone’s throw from the Bridge of Sighs, the Ratcliffe Camera and the Bodleian Library, it’s an Oxford landmark. Once frequented by the likes of J.R.R. Tolkien, C.S. Lewis and Nevill Coghill, in Blackwell’s the discerning reader will still find much to interest, inform and inspire. Quite right in the City of Dreaming Spires. 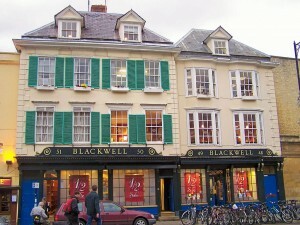 Blackwell’s is in Broad Street in Oxford. The shop also runs various events and for details of these and more visit broadconversation.com, a website run by Blackwell’s Oxford branch. ← Review: Don’t Call it Literacy!